To deal with my no-fun-Monday issue, the last few weeks I've raced off to the grocery store solo if I wake up before 6:30 am. Imagine the guilt I feel for slowing down the ONLY checker with my large order when most other early morning shoppers are grabbing a few donuts or a gallon of milk. I try to cope with the grumpy faces in line behind me and the fact that I have to make a second trip to visit the currently closed meat counter. Constantly checking the time, I brace for the hectic pace of getting kids to school once I arrive home. All worth it knowing that this pesky task is complete. This week I rolled out of bed at 6:30 - not before. Those extra few minutes cost me, even though I bought less than I usually do. I called home to alert someone to wake up Curly. No one answered. Both Tank and Reg were eating breakfast when I darted out the door donning my sweats, glasses, and bed-head hair. Where were they?! 'I HAVE DONUTS IN MY CART . . . PICK UP THE DAMN PHONE!' Nothing. On the street en-route to my neighborhood I drove up behind a school bus. Perfect. After stopping every 25 feet, I pulled onto my street. Gretta's car sat in my driveway. Yippee. After standing in my empty kitchen for an indefinite amount of time, she left her offspring and headed for her car. When she spotted my 12-seater white Chevy Express van round the corner on two wheels at top speed, she gave a quick wave and headed to work. 'Hello boys!' I called over my shoulder as I darted upstairs to wake Curly. THEN I called Reggie up from the basement. Just as expected - he missed the phone ringing, the boys being dropped off, and the chance to stay on my good side by doing SOMETHING to contribute. He fell victim to the lure of the Xbox and an absent mother. Grrrr!!!! And then there were three . . . supposedly we have 5 landline handsets. Haven't seen the other two for years. There should be a landline handset posted on the receiver in the basement. 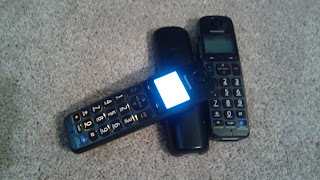 With more than one handset missing, we rarely have a spare for the basement. Not that the children care, but long ago I mandated that they 'bring a phone to the video game cave' on their way down there. Never happens. I almost lost my voice again as I explained the ramifications to Reggie of his Xbox distraction. Curly missed the bus. Gretta had to hang out waiting for me to arrive (she would normally be totally fine with the boys chilling with Reg for a few minutes). 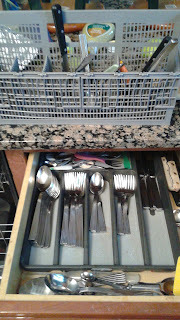 As suspected- he hadn't even unloaded the silverware from the dishwasher. The horror! This job was assigned to him because of his early-riser mode. I assume this will be less likely when he becomes a sleep-till-noon teenager. Then I will need to assume the role of silverware tray myself. Silverware unloading job awarded to Reggie - our early riser! Reggie stood frozen in the kitchen until I dubbed him my slave for the day. I rattled off all what I expected him to accomplish: Bring up the Xbox unit from the basement, and put it on the front seat of my car. (something I've done before, but clearly not often enough. Ages ago when it was only a few months old, I confiscated the stupid game system for over a year). 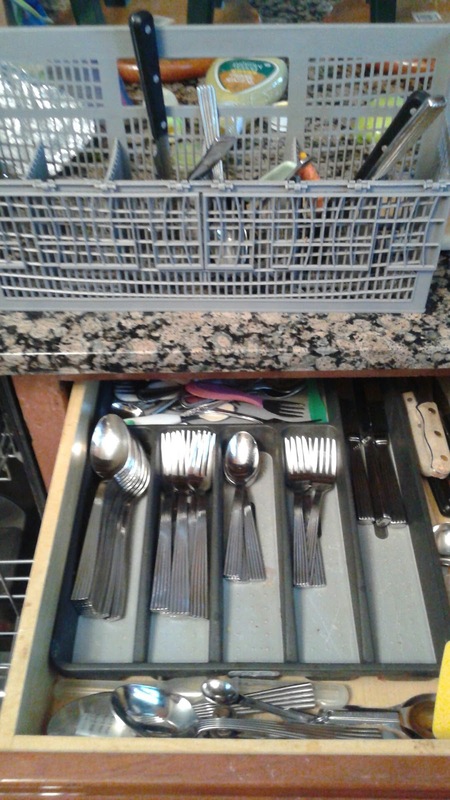 Unload the silverware tray (obviously). Bring in the groceries. Strip beds (another no-fun-Monday chore). Haul certain groceries downstairs to the second fridge/freezer. Wash the table after everyone eats. Load the dishwasher. Gather snacks for lunches. Note the lonely controllers on table, empty shelf below TV, and useless wires abandoned on the floor. 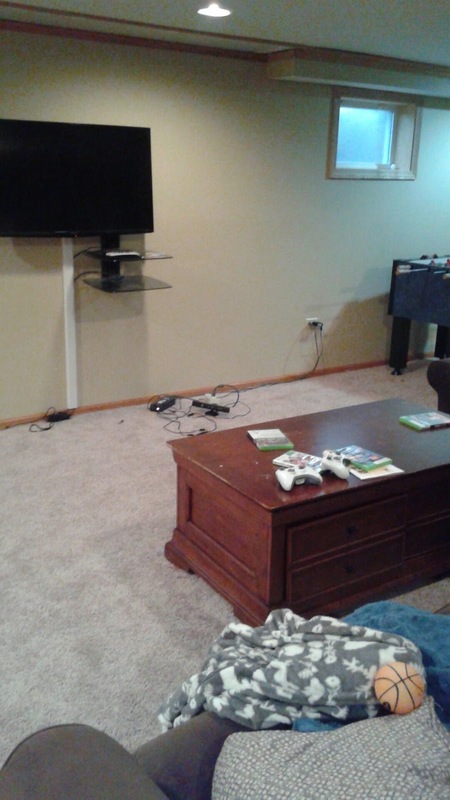 This is what used to be considered the basement fun-zone. Typically when I ask a kid to do something they moan and rattle off the 'jobs' they've done in the last 48 hours. As if that matters. 'But I just emptied the bathroom garbage yesterday' or 'I swept the kitchen after school.' Now I was astounded to see how much one kid, who was in hot water, could accomplish in such a short amount of time. 'Should I start scrubbing the toilets?' He was serious, because he's been in deep doo-doo before and he knows I usually start with toilets. It just so happened that this morning I had more pressing chores that required his assistance. I decided then and there that 'slave for a day' is a punishment I need to utilize more often!